Today, I needed to create a label sheet to print bar codes for a client implementation. So I thought I could share it with all of you. I think that some of you might already know how to do this, but anyway here it is. Add an Item with the No. and Description, next add the Cross Reference of type Bar Code which is not discontinued. As for the layout of the sheet, I didn’t have the exact layout yet, so I looked on the internet for a typical label sheet, just to know the dimensions, and started from there. Here is what I used as an example. 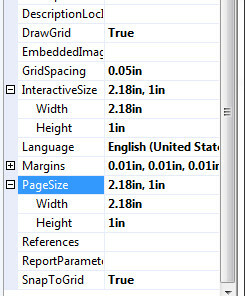 We can basically set the page size and margins, but nothing else. So I started there. My example said it was A4, so I set that. I didn’t notice a left or right margin in the example, so I set them to 0, I left a little top and bottom margin. Now I could start by adding a list linked to the dataset, and add my fields. Before that, I also set the body size to 70mm wide and 36mm height. So, as you can see, it really wasn’t that hard. When the label needs to be changed, I only need to change it 1 time. When I get the actual sheet size and label size, I need to change my page setup and the body size and I’m set. I hope this helps you finding the properties whenever you’ll need to make a label sheet or something similar. This entry was posted in Coding, Dynamics NAV, NAV2013 and tagged Print, RDLC, Label by Magno. Bookmark the permalink. Many thanks – I was not really aware of the Columns property yet! Hey, thank you for the suggestion, but as you already point out, this is something the Dynamics NAV team blogged about themselves. Hi, I followed the steps you outlined here, but my labels are still all showing under the first column. Am I missing something? Which version did you use of NAV? If I follow the steps in the post in a NAV2013 Database this looks right to me. I have a basic question about this post. In First step your create a dataset, so how can i create this dataset ? a) Can i create this on report designer? b) Or i need to create at code side? By adding DataItems & Columns in the development environment, the dataset is created, you do not need to do anything special for it. Would like to know how to print on a specific position on the sheet. Say, I wanted to start printing on the 3rd position… is that possible? Maybe you could keep a boolean Visible in your dataset, and apply this boolean to every control on the report? I think this would be the easiest way. In your NAV code, you could send x blank records with the visible boolean set to false to RDLC. I downloaded you demo report, but that is not printing in next column. All the items are printed below each other. Am I missing some thing. Did you try looking at the “Print Layout” (button next to the printer button)? Or try looking at the PDF version. Since the preview rendering is not always what the actual result is. In this case, it seems that the preview itself cannot handle the columns. I’m using MSSQL & VS2012…I inserted a “list” in the first column of my rdlc, put all the fields I wanted from my dataset in the list box, and I’m getting multiple pages with all the data in the first column as well. Have you tried the sample report I provided, to see if that also prints in only 1 column? If the report allows to import into a clean standard NAV database (without a lot of custom or add-on source fields), you can always share the text export. I could have a quick look to check if I get the same result as you say. Sure, You could create another integer data item and loop however many times you want it. Basically the same as you would do with a copy loop for any document report. If I understand correctly, you want to print a rectangle around the data, and only the rectangle if there is no data? For your case, I think the most convenient would be to check if there is data before, and send blank data if there is none. If you only supply 1 record, it will be printed in the first row, first column by default. The rest should be printed without data, not sure how rectangles, lines, … will react though. Some barcode scanners use different fonts they can recognize. You might want to check the supported barcodes and if necessary change the font on your RDLC to 1 which is supported by your scanner. Thank you for your reply. In fact the barcode scanner reads code 128. I have tried all the different type of code 128 (A, B, C) but none is rendering the same output for the barcode. Hello…. I followed your instructions but I’m only getting the first column and only the first record to be displayed in the report viewer. Do you have an idea what could be causing this issue? Thank you for the help. What is the output when you “save as PDF”? Maybe the report viewer only shows the first result? Hi, I am also facing the same problem. I had also saved it into pdf but its only showing first record. Have you tried with downloading the sample to see what happens then? This should print multiple columns. If the sample works as intended, you could compare the text export to see which properties aren’t the same in the RDLC? its have 500 datas but show only one column datas…how to show 3 column..plz help.. Which version of NAV are you using? This could depend on the font you are using. Not all barcode readers can read all fonts. I have been trying to print barcode from a receipt printer using roll paper, but can figure it out yet. Can you help? Do you need to print “normal layout” to the printer, of do you need to send printer codes, the same as label printers? This looks like the paperlayout in your printer settings. it only works in one column for the print preview but works a treat when they print or export to pdf etc. thanks for this though it was very useful. In regards with the comments on the barcodes. As far as I can tell the string to become barcode needs to be encoded first then sended to the textbox. I´ve writen a vba application in the past and that was the first issue I ran into. So you need to find a library to encode it first then send it to the textbox. so on 2nd page label no 9 will print and 10 number will print side by 9 no. not below. i applied column grouping but after 8 label getting rendering error.